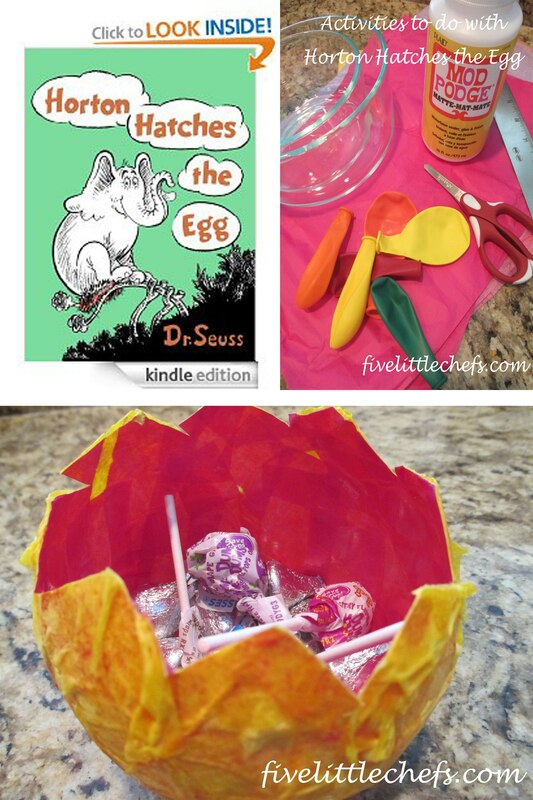 Have you heard of the book Horton Hatches the Egg ? We hadn’t until we were looking at Dr. Seuss books at the library. We came across Horton Hatches the Egg and brought it home. We liked this book because it is based on an Elephant, Horton, who told a bird he would sit on her egg and wouldn’t get off. He sat on the egg through rain, snow, hunters, and others laughing at him. But he continued to say “I meant what I said, And I said what I meant…. An elephant’s faithful One hundred per cent!” This is a great lesson, for all of us. If we commit to something, we need to be “faithful One hundred per cent”. Step 1: Using the edge of the metal ruler, tear strips of tissue paper. I like to use a metal ruler to ease how many cuts you need to make. I then give the strips to the Little Chefs and let them cut them into squares or shorter strips. Step 2: Blow up a balloon until it is in the shape of an egg, tie off the balloon. Step 3: In the large bowl, combined 1 cup warm water and 2 cups Mod Podge. Mix very well. If you are making multiple eggs you may need to repeat these step to make more. 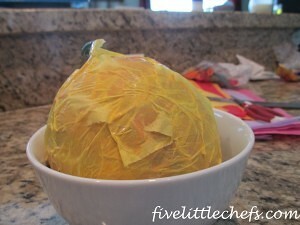 Step 4: Soak tissue paper strips until they are saturated. Take out 1 piece at a time, removing excess liquid with fingers. Work from the top to the bottom, apply pieces to your balloon. You want to overlap them slightly. 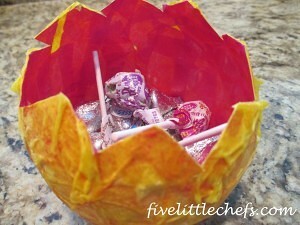 Once the balloon is covered with one layer, continue with a middle and top layer. Keep working while the paper is wet. Let this dry at least 24 hours. NOTE: Keep it away from heat. The heat can cause the balloon to expand, or cause buckling of the shell you are making. Step 5: Pop the balloon at the top. It will gradually release the air and shrink so it is not toughing the outside of your shell. Cut a larger hole in the top to remove the balloon. At this point you can make the top hole larger to fill for your kids to have a surprise, or you may leave it as is for your kids to enjoy. 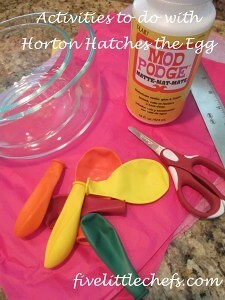 I wanted to have a couple eggs for my little chef to open after reading Horton Hatches the Egg. I made a larger hole in the top so the “surprise” was able to fit, and used a few more pieces of tissue paper to cover the hole. Little Chef K was so excited so have his own egg that he could open. Do you want a fun activity for the younger kids? Why not match the eggs. 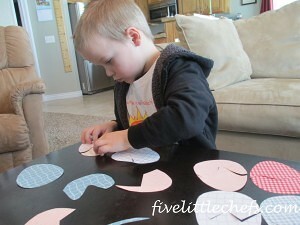 All you need is scrapbook paper and scissors. Cut out as many egg shapes as you would like. Once you have done that, cut each egg in half using different patterns. Some can be round, some can be jagged, some can be straight. Then let your little chefs sit down and match all the eggs. See what other fun we have been having with books. Check out Ten Apples Up On Top and Charlie and The Chocolate Factory. 1 Reply to "Horton Hatches the Egg"